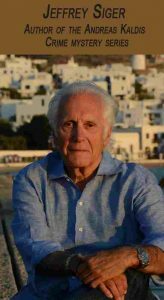 Jeffrey Siger is an American author known for his Andreas Kaldis mystery series set on various islands in Greece, with a focus on Mykonos. 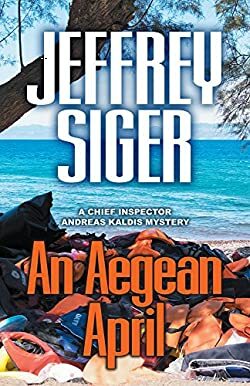 Jeffrey Siger has written so far 9 books in the series, with the latest one, An Aegean April released in 2018. The author also published stories in two anthologies: The Missing and Plotting From Epiphanies. Here are the Jeffrey Siger books in order for his Andreas Kaldis crime mystery series. Jeffrey Siger (website) is an American author living on the Mykonos island in Greece. He was born and raised in Pittsburgh, Pennsylvania. He received his law degree from Boston College. He started working at a leading Wall Street law firm. During his work there, he became Special Counsel to the citizen’s group responsible for covering the city’s prison conditions. After a while, he left his New York law practice to work for his own firm in Manhattan, focusing on working high profile society scandals and international and domestic disputes. After several years, however, he gave up his lucrative legal career – at the height of his practice – to focus on writing crime mystery thrillers set in Greece. Right now, Jeffrey Siger is a full-time crime mystery novelist living a half year in Greece and the other half in the US, back at home. He first visited Greece in the early 1980s, and he has fallen in love with the islands, especially with Mykonos. When the author Jeffrey Siger moved to Greece over 20 years later, that’s the very island he moved to. That is also the island that features in the first Andreas Kaldis novel. He has been living in Mykonos (on and off) for over 35 years now. As I am spending almost every summer on one or the other Greek island, this series is really close to my heart. For example, there are stories set on the beautiful Mykonos island, in Athens, the small islands of Tinos and Patmos, as well as in Sparta in Pelloponisos. While going down to Pelloponisos, we drove several times through Parta, the iconic historical city. In fact, one of the last holidays I had in Greece was in Pelloponisos, and we visited historical Sparta as well. Discovering this author gave me a renewed interest in the Greek culture, society, and history. With over 6000 islands in Greece, I am sure the author will not run out of island material for his novels anytime soon. Murder in Mykonos after it’s publication became the #1 best selling English-language book in Greece, which is a first for this country. In the book, we are introduced to Andreas Kaldis. He is new at the police, recently appointed chief of police and a bit unorthodox in his manner and way in which he solves cases. He is far from being politically correct in his investigations, and he is a very honest and observant person. Before moving to Mykonos, Kaldis was working as a homicide detective in Athens. He is a second-generation Athens cop. Now, with his feet still wet, he is asked to a remote church to investigate the murder of a young woman whose body has been found in a nearby crypt. Through the books (and the subsequent novels in the series), the author brings the readers a few glimpses into the current Greek political situation, lifestyle, culture and economy. There is a lot of corruption in Greece and the author has a knack of revealing quite a lot of it in the series. 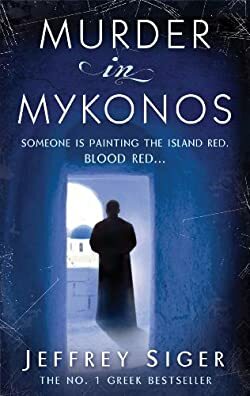 The latest book in the Andreas Kaldis series is set in Lesbos, also killed Mytilini, the island where the popular two brands of Ouzo are made in Greece: Varvayannis and Plomari. With its immense success right from the start, it is not surprising that the series is both published in English and in Greek as well. In addition, the Jeffrey Siger books have been published in several other countries such as Germany, South Africa, UK, Canada, Australia, and New Zealand as well. “An Aegean April” came out January 2, 2018, and I expect #10 to be out by Spring 2019. Thank you so much for letting us know about book #10. I love your series and looking forward to it. When is the next book of the Andreas Kaldis Series expected?